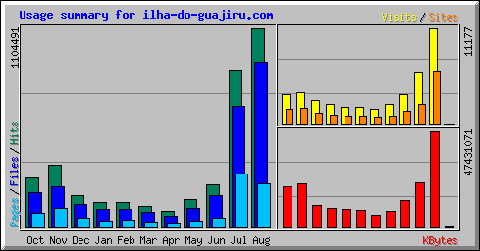 Sky high website hits announce huge visitor numbers intending to visit Ilha do Guajirú! Impressive website hits (passing 1,1 million!) mark the unmatched success of Ilha do Guajirú, the Flatwatersea!, meanwhile becoming extremely popular with all kiteboarders and windsurfers that visit Brazil later this year, as from August! But also numerous other visitors, attrtacted to come and see what makes this island meanwhile famous as an Ecological Paradise, like sailors, trekkers, cyclists, eco tourists or simply Brazil loving holiday makers! After as much as 125.000 Tourist Guides have recently been launched during July in 8 watersports magazines in more then 16 countries, all over europe, the site is able to measure it's rising popularity directly with the sharply increasing hits per each week that passes! Also come and discover Ilha do Guajirú, and enjoy the best of a lifetime watersports or ecological holiday ever, one you will for sure remember!